Looks like a good time, you guys did a lot in a short weekend trip! Hard for much to compare to the scenery you can find in the mountains, the last picture is gorgeous. That's great that you were able to go to the family reunion and get together with your siblings and cousins. Wonderful photo of you all together. I haven't been to New Orleans in 30 years. 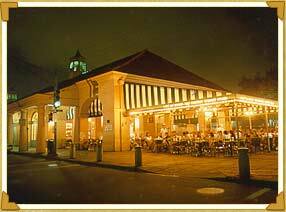 I still remember how good those beignets at the Cafe du Monde tasted and how unusual I thought the Chicory Coffee was. Watched a riverboat race on the Mississippi, all good memories. All were great photos but oh my, the last one and your header, absolutely magnificent! It looks like a good trip. I agree, though, a little time in the city and I long for open space, free of the press of humans. Time spent with family is always great fun but there is no place like home. Your header is such a knockout, simply gorgeous! I have heard friends say almost the same thing you did "We won't be flying (fill in the blank) ever again." Sad story. Glad I don't have much occasion to fly! Never been to N'orleans, but I'm just not a city gal. And although it's good to see family, I'll bet you were glad to get back to the country. I'm glad you had a great time in New Orleans with your family, even if American Airlines did mess up your return trip. I enjoyed your pictures and the information. Betsy lived in New Orleans and has promised to take me there, but we haven't made it yet. such a lot enjoyable trip with happy family. each pictures looking nice but last is more delightful. thanks for sharing your experience. Great shots of New Orleans. There is a virtual cache at the monument you photographed. I love the city for visiting. I'll take Tulsa thank you to live in. Looks like you and your family had a good time in New Orleans. It's fun to take time to catch up with family. Mr. J and I have gone to New Orleans twice. The beignets at Cafe Du Monde are delicious!. And I took a cooking class while we were there and brought home a cook book with me. I've made a few things, but they don't taste quite the same. We also enjoyed a crawdad boil while we were there. My favorite food were the mushrooms, the best I've ever tasted. I'm glad you are back home though riding through the mountains of Utah. I always enjoy your posts so much. Too bad about AA....customer service is so important. Glad you are back in your stomping grounds. You're a long way from your roots, Janie. But, like me, I think you've put down strong ones in an area you dearly love. That last photo says it all! Glad you had a chance to visit with relatives. I've never been to New Orleans. I love New Orleans but not in July! Glad you enjoyed the trip and glad you are back home in the mountains. I see you have a similar feeling as I have about some CEOs and their relationships with their customers. Hmmmm. New Orleans is such a beautiful place with much history & character..from the descriptions of LA, NY and NO, I am attracted to visit NO most when in US!! and yes, a family reunion is always fun!!! Looks like a great time. A lovely series of photos. Time in the city is good but it's so much better out of it.